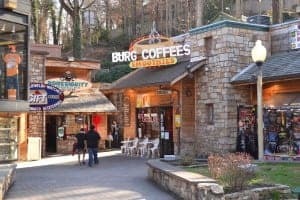 Thinking about planning a trip to Gatlinburg and the Smoky Mountains, but you aren’t quite sure what to do once you get here? Let us help! Read through the list of our favorite Gatlinburg vacation ideas for families to get a jumpstart on your travel planning today. One of the biggest reasons families choose to take a vacation is because they are looking to spend a couple of relaxing days away from their life at home. When you are on vacation, there are no after school activity schedules to juggle, no long work meetings, and no alarm clocks to wake you up early. Vacations are your chance to unwind and rest. That being said, there is no shame in spending your Gatlinburg vacation tucked away in a relaxing cabin rental. In fact, we encourage it! Our Gatlinburg cabin rentals are specifically designed to make families and guests feel as at home as possible during their stay, with a few luxurious touches thrown in, of course. Our cabins also offer a variety of amenities to keep guests entertained during their stay. An example of these amenities includes full-sized pool tables, movie theater rooms, game rooms, outdoor jacuzzis, relaxing outdoor firepit, and more! Click here to browse through all of the great amenities our Gatlinburg cabin rentals offer. One of the best parts about treating your family to a fun and festive Gatlinburg vacation is that there is no shortage of fun things to do once you are here. That is why one of our favorite Gatlinburg vacation ideas for families includes getting out and exploring the area. This can include anywhere from hiking in the Great Smoky Mountains National Park, enjoying a scenic auto tour or discovering your new favorite attraction in Gatlinburg or Pigeon Forge. Your options are truly limitless. If you want to learn more about all the great outdoor adventures in the Smoky Mountains waiting to be discovered by your family, be sure to check out the Area Attractions section of our website. There, you will find a full list of all the fun things to do in the area, as well as a list of all the thrilling upcoming events in the Smoky Mountains. If you have ever been to the Smoky Mountains before, you know we love to sing and dance. This is the birthplace of Dolly Parton after all! That being said, if you and your family love music almost as much as we do, why not add on a visit to one of the many comedic musical shows in Gatlinburg and Pigeon Forge to your list of Gatlinburg vacation ideas for families. Not only have most of the popular theaters in the area recently released their brand new shows for the season, but many of the old favorites have returned as well. An example of some of the most-popular music theaters in the area includes Sweet Fanny Adams, Country Tonite Theatre, Dixie Stampede, and Smoky Mountain Opry. If you don’t want to be cooped up inside and listen to music during your Gatlinburg vacation, you can always swing by the Gatlinburg Arts & Crafts Community or one of the visitor centers. There, families and guests have a good chance of catching one of the local musicians in action, whether it be plucking on a banjo or humming an old mountain tune. If you and your family love to shop, you will love our last Gatlinburg vacation idea for families. This is when we are going to encourage you to shop until you just cannot shop anymore. And what better place to do this than in Gatlinburg and the Smoky Mountains? Did you know our area is home to hundreds of unique shops and stores that are filled with trinkets and souvenirs that are sure to please even the pickiest shopper? These stores have homemade candles, authentic leather works, masterful oil paintings, hand-spun fabrics, and more! What is great about all of the knick knacks and souvenirs you can find when shopping during your Gatlinburg vacation is they also make incredible gifts for your friends back home. This means that you can get an early start on your Christmas shopping, stock up on birthday gifts, prepare for next Valentine’s Day, or, simply, show your loved ones that you were thinking of them while you were away. Still not sure where to start with planning your next family vacation to Gatlinburg? Feel free to contact us! Our vacation planners will be more than happy to answer any and all questions you and your loved ones may have.